Hardware store or Cat food ? Pulled in to pick up Noah from the sitters an there he was sitting in the middle of the drive way with Wendy his childcare provider sitting on the ground beside him. I couldn’t image what they were doing. That’s when I saw the kitty. The second I pulled in Noah gave me a pleading look. The moment I opened my car door he the words “MOM CAN I KEEP HIM PLEEEEASE ” came flooding out of his mouth. I look at Wendy and while responding to him “oh honey she probably belongs to someone” (HINT) . Wendy said “nope ! she’s definitely as stray ! Oh and she looks pregnant , the poor thing !” Noah wailed again “MOM PLEASE ! PLEASE !” I quickly responded with I don’t have a cat carrier to get her home anyway. Wendy’s neighbor who until then had been enjoying watching the conversation jumped up and ran for her house “I got one” she said with waaay to must exuberance . 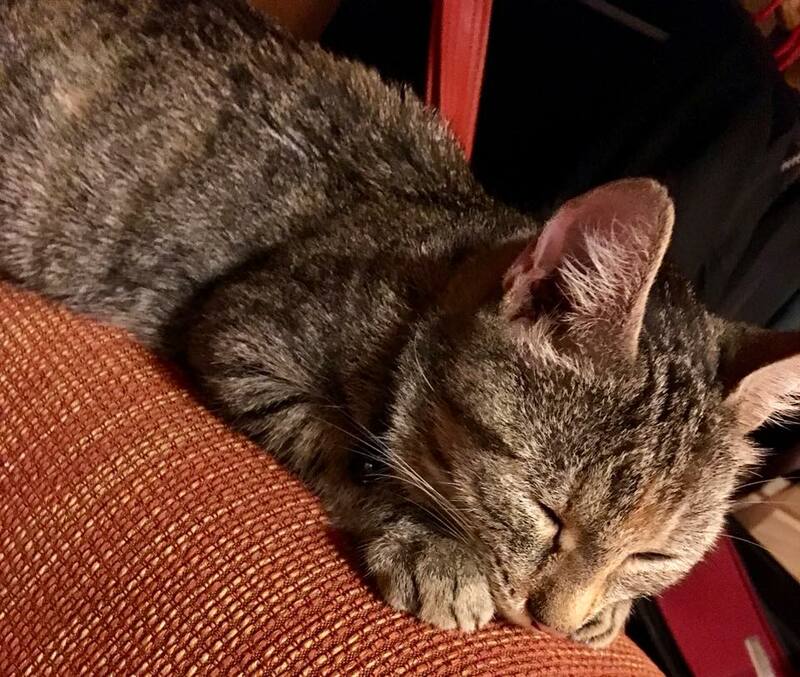 She is probably loaded with fleas I said in defense and a few more retaliations…..
Everyone meet our newest family member MISS Pricilla !! The trip to the hardware store was cancelled and off to Walmart we went to get all the kitty essentials. 70 bucks later we was home with Pricilla, she was deflead and sporting a snazzy red collar with a bell. Being pregnant I was concerned that flea chemicals would be harmful for her and her babies so I aired on the side of caution and bought tea tree oil for her. WELL GUESS WHAT FOLKS ? Tea tree oil is toxic for cat !!!! I haven’t had this poor soul only a few hours and have already nearly killed the poor thing ! She is so sweet and has let me torcher her all evening trying to get all the oil out of her fur. Now all I can do is watch and pray that she will make it through unscathed as there is no treatment for tea tree oil poisoning. Hopefully I will be back tomorrow night with good news and NEW TINY HOUSE PICTURES !! Previous PostPrevious Creativity ! The TRUTH ! Next PostNext Tiny House BIG PROBLEMS ! !